Broccoli isn’t a traditional Korean vegetable, so this is something that I invented. I hope you like it! 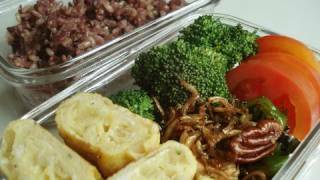 In this video, I am demonstrating how to arrange broccoli and 2 other side dishes that I have already posted on my website in Korean lunch box called Doshiraak (도시락). This is going to be good chance for you to review some Korean recipes and also to give you an idea of making your own lunch in a lunch box. Check my recipes for the 2 other side dishes: rolled egg omelette and dried anchovy side dish, and make your own dosirak. Enjoy my recipe!! Put 5 cups of water, ¼ cup of salt, ¼ cup of sugar, and ½ cup of vinegar into a pot and bring to a boil. Separate the florets from the stems with a knife and cut them into bite sized pieces by cutting lengthwise into halves or quarters. Remove the tough bottom ends of the stems, and skin off the rough parts. Then cut them into bite sized pieces. Rinse and drain the broccoli florets and stems and put them into a strainer over a large bowl. When the pickle juice boils, pour it over the broccoli little by little to blanch. The hot boiling juice will go through the strainer and gather in the bowl under the strainer. Immerse the blanched broccoli into icy cold water to keep its bright green color. Strain it. Put the broccoli into a glass jar and wait until the pickle juice cools down. After the juice cools, pour it into the jar and close the lid. Posted on Wednesday, May 27th, 2009 at 1:07 pm. Last updated on October 5, 2014. Posted May 28th, 2016 at 11:33 pm | Log in to reply. It must really depend on what kind of salt and sugar one uses because using just regular sea salt, I made mine way too salty following the recipe. I also used raw sugar and they also turned out much less sweet than I expected. But the crunch is wonderful, more than enough to want to keep the recipe! Next time I’ll just tweak the salt and sugar amounts by a little to adjust them to my taste. I pickled broccolli and cauliflower together, yum! Posted August 17th, 2015 at 12:02 am | Log in to reply. hi Maangchi, I made this pickled broccoli of yours and as usual it tastes very delicious. Can’t get enough of it and I was wondering can I reuse the pickle brine solution to make another batch of pickled broccoli instead of making a new one? Posted August 17th, 2015 at 9:47 am | Log in to reply. I’m glad you like the recipe. I don’t reuse the brine. Fresh brine with fresh ingredients is better. Posted August 11th, 2015 at 4:20 pm | Log in to reply. Hi, how long can these broccoli pickles last in the refrigerator? Posted April 6th, 2013 at 1:06 am | Log in to reply. how super yummy and healthy. i hope to run into you one day at Bryant park. i’m a big fan :) i was just there a few ago with my daughter playing ping pong. great lunch box recipe. thanks! Posted February 20th, 2013 at 5:51 pm | Log in to reply. Thanks for helping me use up my broccoli, Maanghci. I so like your Korean recipes. I make a variation of this pickle brine with garlic, onion and peppercorns but with less salt. You can pickle many veggies this way especially cucumber. You can also use carrot, cauliflower, ripe tomato, asparagus, bell peppers use your imagination. I used to keep the brine going and continually add veggies as the old ones are eaten. Add a ‘little’ more vinegar when the flavor seems weak. Posted September 14th, 2012 at 8:30 am | Log in to reply. What Kind of Rice did you make for this doshirak? Posted September 14th, 2012 at 4:15 pm | Log in to reply. Posted September 19th, 2012 at 11:42 am | Log in to reply. Posted September 19th, 2012 at 12:25 pm | Log in to reply. This recipe was originally posted on May 27, 2009 at 1:07 pm by Maangchi. It was last updated on October 5, 2014. The video was watched 151,233 times on YouTube & has 1,145 likes!